Debbie and I are both snacky people. Grazers. Kevin calls me the Taste Testing Queen lol. Debbie’s biggest weakness is snacking after dinner. We love to just eat a little bit here and a little bit there as we go through the day. The key is to do this while eating healthy whole food, not chips, crackers or other processed junk. 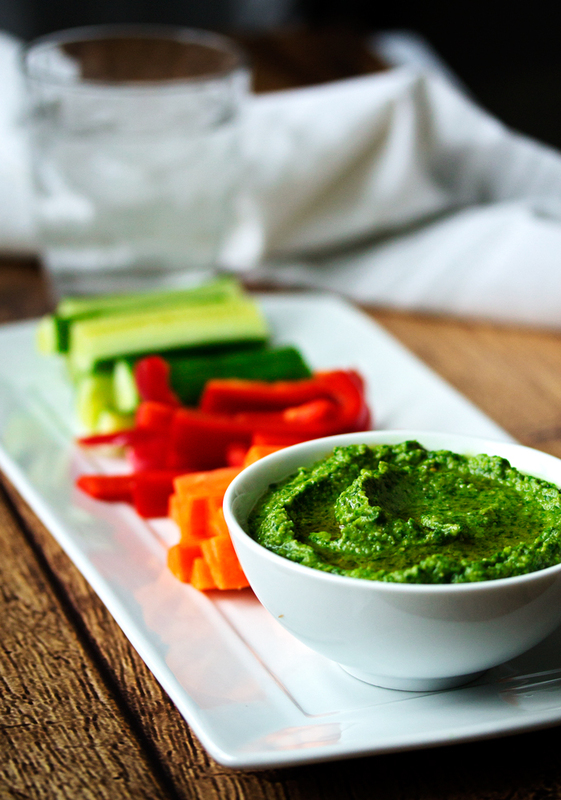 So we are always looking for good-for-you clean eating snacks and this one is a keeper! I was walking through Whole Foods in Vancouver the other day and I felt like I was in foodie heaven! Tons of packaged pre-cut and washed fruits, vegetables and other ready to eat nutritious snacks lined their cooler shelves next to the most amazing produce section. I felt like going buck wild and filling my cart full of handy and healthy snacks, but then I had to remind myself that I could easily make or chop up the exact same thing for half the price or less. Whole Foods is awesome! But its also expensive! That weekend I told Debbie about some Spinach Hummus I had seen at Whole Foods and we decided that we should have that to snack on while we cooked and tried out recipes for the blog. Turns out Debbie had everything we would need on hand so we set to work, tasting as we went until we got the perfect recipe. 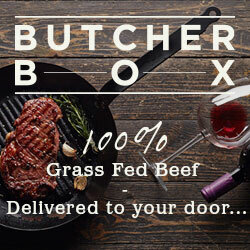 It was so good, we decided to share it with you all too! We love our hummus with lots of garlic flavor, so if you are not a huge garlic fan or you don’t like it too strong, you should start off with one clove and then work up to two. Two cloves may not sound like a lot, but for some reason, the raw garlic imparts huge flavor to the hummus without having to use a ton. We also use Red Russian garlic as much as possible. Its expensive, yes, but the flavor is far superior to regular garlic and its quite a bit stronger so you can use less. If you are buying Red Russian garlic, make sure you squeeze the bulbs and only purchase bulbs that have hard cloves. If it is sort of spongy or soft, the garlic could be moldy and for the price you pay, you want it to be good! 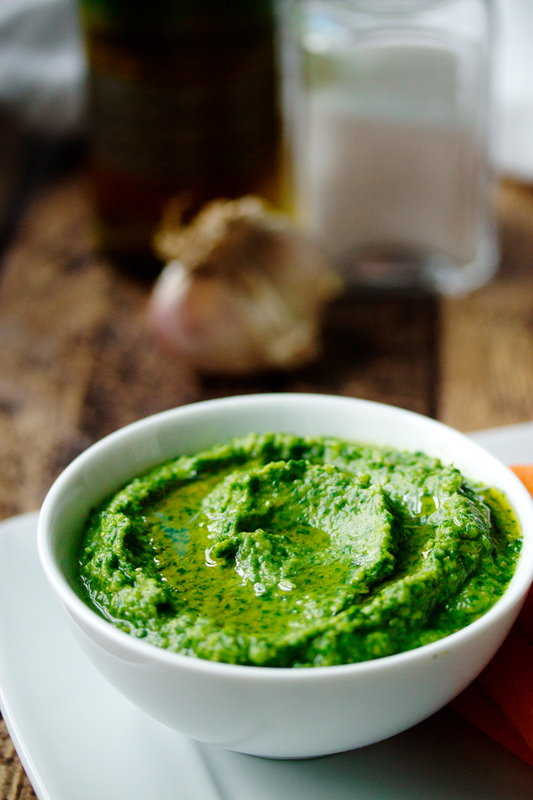 We managed to pack a whole box of spinach into this hummus recipe. 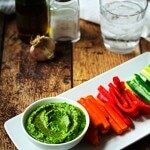 I love recipes that give you a lot of nutritious green vegetables without tasting “green”, if you know what I mean. We weren’t sure we would get more than half in there, but we just kept adding and tasting and it was awesome! This would be great for getting kids to eat spinach. 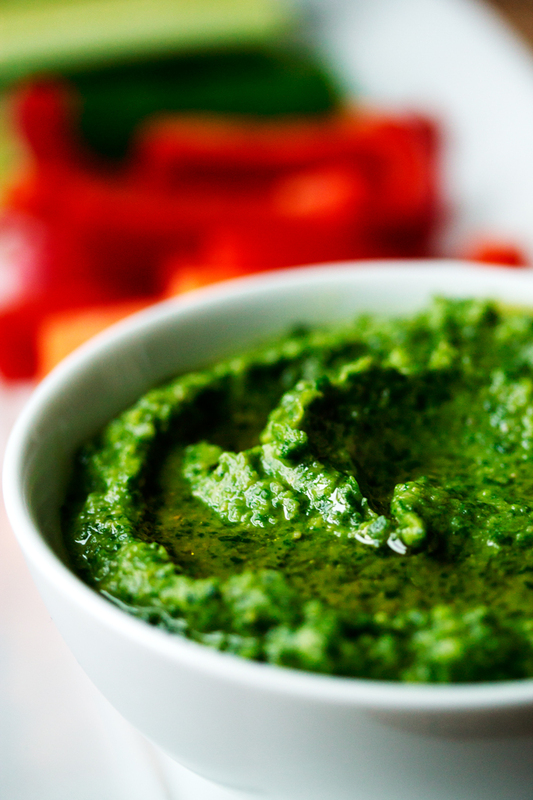 If your kids like hummus, there’s a good chance they will like this one with spinach. You would hardly know its there except for its beautiful bright green color. You could eat this hummus with traditional pita bread, which would be pretty tasty. 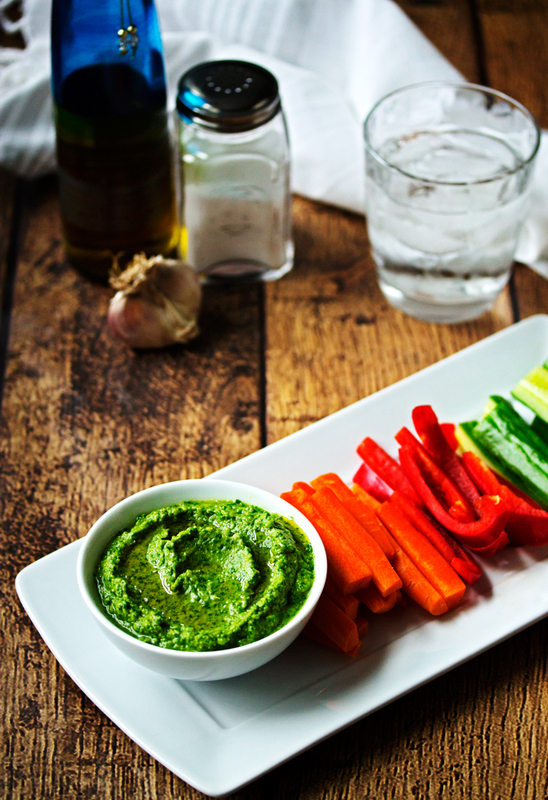 Or you could eat it with tortilla chips or spread it on a sandwich… But we prefer to eat it with vegetables which makes a low carb, nourishing and incredibly colorful snack or appetizer. Open the chickpeas, drain and wash well. Add them to a food processor. 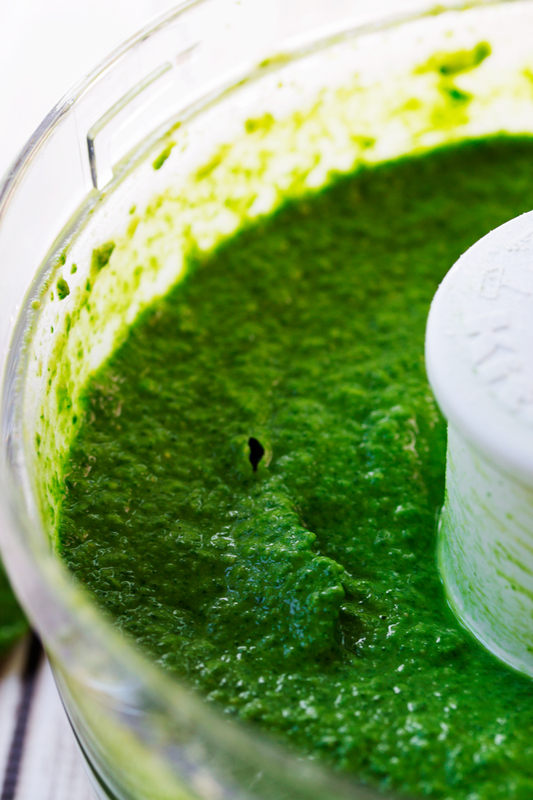 Add the rest of the ingredients to the food processor except for the spinach. Add only a couple handfuls of the spinach. Blend on high for a few seconds. Add more spinach. Blend again. Continue this until the spinach is gone. Blend until the mixture is smooth. Adjust the seasoning with salt and lemon. Serve with chips or vegetables to dip. Yup, I’m a total snacker too, so this would be soooo good to have on hand in the fridge! And wouldn’t it be nice if all those sticks of celery, carrots and peppers just magically appeared in the fridge, like at Whole Foods? Oh, and Russian Red… my CSA and farmers market grow it!! So I know… it is sooo good! Thank you two for this delicious, nutritious recipe! This looks really good! I shared it on my page. I LOVE spinach. Thanks for the recipe!